A benefit concert or charity concert is a type of musical benefit performance featuring musicians, comedians, or other performers that is held for a charitable purpose, often directed at a specific and immediate humanitarian crisis. A television special is a stand-alone television show which temporarily interrupts episodic programming normally scheduled for a given time slot. Specials have been produced which provide a full range of entertainment and informational value available via the television medium, in various formats, and in any viewing lengths. The British Red Cross Society is the United Kingdom body of the worldwide neutral and impartial humanitarian network the International Red Cross and Red Crescent Movement. The society was formed in 1870, and is a registered charity with more than 32,500 volunteers and 3,500 staff. At the heart of their work is providing help to people in crisis, both in the UK and overseas. The Red Cross is committed to helping people without discrimination, regardless of their ethnic origin, nationality, political beliefs or religion. On 22 May 2017, a suicide bombing was carried out at Manchester Arena in Manchester, England, following a concert by Ariana Grande as part of the singer's Dangerous Woman Tour. 22 of the concert-goers and parents who were in the entrance waiting to pick up their children following the show were killed, more than 500 were injured and 116 of those were seriously injured. The Latin adverb sic inserted after a quoted word or passage indicates that the quoted matter has been transcribed or translated exactly as found in the source text, complete with any erroneous, archaic, or otherwise nonstandard spelling. It also applies to any surprising assertion, faulty reasoning, or other matter that might be likely interpreted as an error of transcription. Event tickets were made available on 1 June 2017 for £40, and sold with no booking fees. These tickets sold out within 6 minutes of going on sale. Fans who were at the concert of 22 May could apply to attend at no cost. 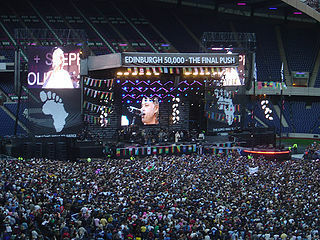 The application ended on 31 May at 17:00, but was extended till 22:00 to allow as many people at the concert on the 22nd to apply to be there as possible. Metrolink offered free travel for concertgoers to and from the Old Trafford tram stop. Uber also said that fares of passengers travelling to and from the concert will be donated to charity. A minute's silence was held before Marcus Mumford opened the concert, at the request of Mumford, in memory of those killed both in Manchester and in London. After Grande's first performance of the night, Stevie Wonder appeared via video link. After Heap's performance, a video of prominent Manchester footballer David Beckham reading a poem dedicated to the city was played. Videos of other artists and celebrities, including Halsey, Bastille, Anne-Marie, Demi Lovato, Jennifer Hudson, Blossoms, Chance the Rapper, Camila Cabello, The Chainsmokers, DJ Khaled, Little Mix, Circa Waves, Kendall Jenner, Clean Bandit, Dua Lipa, Sean Paul, Nick Grimshaw, Kings of Leon, Sam Smith, Rita Ora, Shawn Mendes, Twenty One Pilots, Paul McCartney, U2 and the players of Manchester United and Manchester City declaring their solidarity with Manchester were also shown. Pharrell Williams – "Get Lucky"
Pharrell Williams and Miley Cyrus – "Happy"
Niall Horan – "Slow Hands"
Niall Horan – "This Town"
Ariana Grande – "Break Free"
Ariana Grande and Victoria Monét – "Better Days"
The Black Eyed Peas and Ariana Grande – "Where Is the Love?" 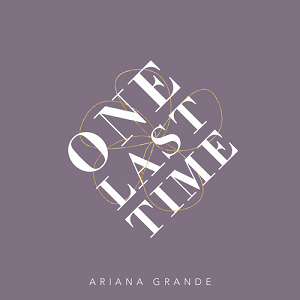 Ariana Grande and Parrs Wood High School Choir – "My Everything"
Ariana Grande and Mac Miller – "The Way"
Mac Miller and Ariana Grande – "Dang!" Ariana Grande and Miley Cyrus – "Don't Dream It's Over"
Ariana Grande – "Side to Side"
Katy Perry – "Part of Me"
Justin Bieber – "Love Yourself"
Justin Bieber – "Cold Water"
Ariana Grande – "Love Me Harder"
Ariana Grande and Coldplay – "Don't Look Back in Anger"
Coldplay – "Something Just Like This"
Liam Gallagher – "Rock 'n' Roll Star"
Liam Gallagher – "Wall of Glass"
Liam Gallagher and Coldplay – "Live Forever"
Ariana Grande and all other artists – "One Last Time"
Ariana Grande – "Somewhere Over the Rainbow"
The event was broadcast live on at least 65 British radio stations, including 39 Global-based music stations: the entire Capital FM, Heart FM, Gold, Radio X and Smooth Radio networks. William John Paul Gallagher is an English singer and songwriter. He rose to fame as the lead singer of the rock band Oasis, and later served as the singer of Beady Eye, before performing as a solo artist after the dissolution of both bands. His eccentric dress sense, distinctive singing style, and abrasive attitude have been the subject of commentary in the press; he remains one of the most recognisable figures in modern British music. "Over the Rainbow" is a ballad composed by Harold Arlen with lyrics by Yip Harburg. It was written for the movie The Wizard of Oz and was sung by actress Judy Garland in her starring role as Dorothy Gale. It won the Academy Award for Best Original Song and became Garland's signature song. "Live Forever" is a song by the English rock band Oasis. 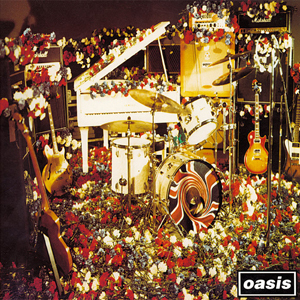 Written by Noel Gallagher, the song was released as the third single from their debut album Definitely Maybe (1994) on 8 August 1994, just prior to that album's release. Parrs Wood High School is a state comprehensive secondary school in East Didsbury, Manchester, England, behind Parrs Wood Entertainment Complex off Wilmslow Road. It educates those from age of 11 to 18 years; A-Levels are taught at the Parrs Wood Sixth Form Centre, which is integrated with the main school. Parrs Wood was the 4th largest school in the UK in 2008, with 2,030 students and 450 in the sixth form centre. "Don't Look Back in Anger" is a song by the English rock band Oasis. It was released on 19 February 1996 as the fifth single from their second studio album, (What's the Story) Morning Glory? (1995). The song was written by the band's guitarist and main songwriter, Noel Gallagher. It became the band's second single to reach number one on the UK Singles Chart, where it also went platinum. "Don't Look Back in Anger" was also the first Oasis single with lead vocals by Noel instead of his brother, Liam. The Mylo Xyloto Tour was the fifth concert tour by British band Coldplay. Launched in support of their fifth studio album Mylo Xyloto (2011), the tour began in the spring of 2011 with a series of one-off concerts in Europe and festivals including Rock in Rio in Brazil. A full-production show began in December 2011 in the United Kingdom. It continued into 2012 with shows in North America, Europe and Oceania. 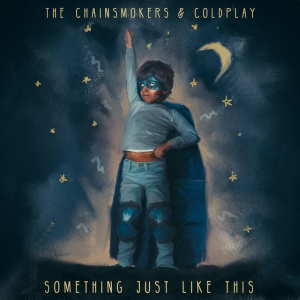 "Something Just like This" is a song by American electronic music duo The Chainsmokers and British rock band Coldplay. It was released on February 22, 2017 as the second single from The Chainsmokers' debut album, Memories...Do Not Open, and as the lead single from Coldplay's thirteenth extended play Kaleidoscope. A Concert for Charlottesville was a benefit concert held on September 24, 2017, organized by the Dave Matthews Band to raise funds for the victims killed and injured during the Unite the Right rally held from August 11–12, 2017. The band labeled the event as "An Evening of Music and Unity." Ariana Grande at the BBC is a BBC television special featuring Ariana Grande. Grande performed thirteen songs during the hour-long special, and was interviewed by Davina McCall. The program was announced on 31 August 2018, recorded on 6 September, and aired on 1 November. The BBC special is scheduled to also air in France on 19 December 2018 on NRJ. ↑ "BBC One and BBC Music announces One Love Manchester broadcast plans". BBC Media Centre. 1 June 2017. Archived from the original on 7 June 2017. Retrieved 1 June 2017. ↑ "Why Ariana Grande's One Love Manchester Benefit Concert Matters". Forbes. 4 June 2017. Archived from the original on 5 June 2017. Retrieved 4 June 2017. ↑ "How is a major concert organised at short notice?". BBC News. 31 May 2017. Archived from the original on 4 June 2017. Retrieved 4 June 2017. ↑ "One Love Manchester – BBC One". BBC. Archived from the original on 6 June 2017. Retrieved 2 June 2017. 1 2 Gibson, Caitlin (30 May 2017). "Ariana Grande announces 'One Love Manchester' benefit with Katy Perry, Justin Bieber and more". The Washington Post . Archived from the original on 31 May 2017. Retrieved 31 May 2017. 1 2 Melas, Chloe (30 May 2017). "Ariana Grande Manchester benefit concert featured Coldplay, Miley Cyrus". CNN. Archived from the original on 30 May 2017. Retrieved 31 May 2017. ↑ Bourne, Dianne (31 May 2017). "Black Eyed Peas join line-up for Ariana Grande One Love Manchester benefit concert". Manchester Evening News . Trinity Mirror. Archived from the original on 31 May 2017. Retrieved 31 May 2017. 1 2 Welsh, Daniel (1 June 2017). "Ariana Grande Manchester Benefit Concert Line-Up Adds Little Mix And Robbie Williams". HuffPost . Archived from the original on 2 June 2017. Retrieved 1 June 2017. 1 2 "Ariana Grande to play Manchester benefit concert on Sunday". BBC. 31 May 2017. Archived from the original on 31 May 2017. Retrieved 30 May 2017. 1 2 Ruby, Jennifer (30 May 2017). "Ariana Grande's Manchester benefit concert to air live on BBC One". London Evening Standard . Archived from the original on 13 June 2017. Retrieved 31 May 2017. ↑ Oakley, Laura (30 May 2017). "Justin Bieber, Coldplay and Katy Perry join Ariana Grande for Manchester benefit concert". British Red Cross. Archived from the original on 2 June 2017. 1 2 3 Fox, Hilary; Fekadu, Mesfin (5 June 2017). "Ariana Grande returns to honor terrorist bombing victims with One Love Manchester benefit concert". Associated Press. Archived from the original on 5 June 2017. Retrieved 5 June 2017. ↑ "One Love Manchester: Ticketmaster asks fans for patience". BBC News. 2 June 2017. Archived from the original on 2 June 2017. Retrieved 2 June 2017. ↑ "Ariana Grande One Love Manchester concert live: Coldplay's Chris Martin and Ariana sing Don't Look Back In Anger with crowd". The Daily Telegraph. 4 June 2017. Archived from the original on 4 June 2017. Retrieved 4 June 2017. ↑ Grande, Ariana [@ArianaGrande] (23 May 2017). "broken. from the bottom of my heart, I am so so sorry. I don't have words" (Tweet) – via Twitter. ↑ Blistein, Jon. "Ariana Grande Suspends Tour After Manchester Attack". Rolling Stone . Archived from the original on 23 May 2017. Retrieved 23 May 2017. ↑ Hautman, Nicholas. "Ariana Grande Returns Home to Florida After Manchester Concert Attack". US Weekly. Archived from the original on 24 May 2017. Retrieved 23 May 2017. ↑ @ArianaGrande (26 May 2017). "Photo" (Tweet). Retrieved 26 May 2017– via Twitter. ↑ "Live: Ariana Grande Manchester benefit concert One Love tickets go on sale". Manchester Evening News . Archived from the original on 1 June 2017. Retrieved 1 June 2017. ↑ "Ariana Grande confirms special One Love Manchester concert for Sunday, 4 June". BBC. 30 May 2017. Archived from the original on 2 June 2017. Retrieved 31 May 2017. ↑ Heward, Emily (1 June 2017). "Metrolink lays on free tram travel to Ariana Grande One Love Manchester gig". Manchester Evening News . Archived from the original on 1 June 2017. Retrieved 1 June 2017. ↑ Bainbridge, Pete (4 June 2017). "Ariana Grande 'praying for London' as security is stepped up for tonight's One Love concert in Manchester". Manchester Evening News . Archived from the original on 4 June 2017. Retrieved 4 June 2017. ↑ "Ariana Grande's One Love Manchester concert tickets sell out". BBC News. 1 June 2017. Archived from the original on 1 June 2017. Retrieved 2 June 2017. ↑ Heward, Emily (4 June 2017). "Will Liam Gallagher perform surprise set at One Love Manchester?". Manchester Evening News. Archived from the original on 4 June 2017. Retrieved 4 June 2017. ↑ Pidd, Helen; Halliday, Josh (4 June 2017). "Grande return – Ariana takes Manchester stage at benefit concert". The Guardian . Archived from the original on 5 June 2017. Retrieved 4 June 2017. ↑ Heward, Emily (4 June 2017). "Liam Gallagher brings house down at One Love Manchester". manchestereveningnews.co.uk. Archived from the original on 4 June 2017. Retrieved 7 June 2017. ↑ "Rock am Ring festival resumes in Germany after 'terrorism' scare". BBC. Archived from the original on 4 June 2017. Retrieved 4 June 2017. ↑ Heward, Emily (4 June 2017). "Where was Usher at One Love Manchester?". Archived from the original on 4 June 2017. Retrieved 5 June 2017. ↑ "When is the One Love Manchester concert on TV? Here's everything you need to know". Digital Spy . 1 June 2017. Archived from the original on 7 June 2017. Retrieved 1 June 2017. ↑ Cooper, Matthew (1 June 2017). "How to watch Ariana Grande's One Love Manchester show on TV". Manchester Evening News. Archived from the original on 1 June 2017. Retrieved 2 June 2017. ↑ "BBC Music – The One Love Manchester Benefit Concert". BBC Radio 2. 4 June 2017. Archived from the original on 8 June 2017. Retrieved 19 June 2017. ↑ "One Love Manchester: Euroradio to broadcast star-studded benefit concert". EBU. 1 June 2017. Archived from the original on 21 October 2017. Retrieved 1 June 2017. ↑ "Ariane Grande's One Love Manchester concert will stream live on YouTube, Facebook and more". Digital Spy. Retrieved 3 June 2017. ↑ "Manchester Emergency Fund". British Red Cross. Archived from the original on 21 October 2017. ↑ Redaktori (3 June 2017). "Pas sulmit terrorist, Ariana Grande rikthehet me "One Love Manchester"". Archived from the original on 3 June 2017. Retrieved 3 June 2017. ↑ "En vivo : Ariana Grande vuelve a actuar en Manchester con un show a beneficio". tn.com.ar (in Spanish). 4 June 2017. Archived from the original on 6 June 2017. Retrieved 4 June 2017. 1 2 3 4 5 "E! transmite en exclusiva el concierto benéfico "One love Manchester" de Ariana Grande". webadictos.com (in Spanish). 3 June 2017. Archived from the original on 2 September 2017. Retrieved 4 June 2017. ↑ "One Love Manchester Concert live on UKTV". TV Tonight. 2 June 2017. Archived from the original on 4 June 2017. Retrieved 2 June 2017. ↑ "Airdate: One Love Manchester Tribute Concert. Update: Big Bang Theory". TV Tonight. 2 June 2017. Archived from the original on 2 June 2017. Retrieved 2 June 2017. ↑ "One Love Manchester integraal op Eén" [One Love Manchester integral to One] (in Dutch). VRT. 1 June 2017. Archived from the original on 11 November 2017. Retrieved 1 June 2017. ↑ "One Love Manchester, le dimanche 04 juin à 20:00 sur latrois". RTBF TV. Archived from the original on 12 November 2017. Retrieved 2 June 2017. ↑ "Multishow transmite show de Ariana Grande em Manchester ao vivo" [Multishow broadcasts Ariana Grande show in Manchester live]. multishow.globo.com (in Portuguese). 1 June 2017. Archived from the original on 19 June 2017. Retrieved 1 June 2017. 1 2 3 4 5 Clarke, Stewart (2 June 2017). "ABC to Air Ariana Grande Benefit Concert in U.S. as Global Broadcasters Sign Up (EXCLUSIVE)". Variety. Archived from the original on 2 June 2017. Retrieved 2 June 2017. ↑ "Le concert d'Ariana Grande à Manchester diffusé à VRAK ce dimanche". www.vrak.tv. Archived from the original on 6 December 2017. Retrieved 4 June 2017. ↑ "Koncert pro Manchester – ČT art program". www.ceskatelevize.cz. Archived from the original on 4 June 2017. Retrieved 2 June 2017. ↑ "TV 2". tvtid.tv2.dk. Archived from the original on 7 June 2017. Retrieved 2 June 2017. ↑ ERR (2 June 2017). "ERR-i kanalid kannavad üle Ariana Grande mälestuskontserdi Manchesteris". Archived from the original on 2 June 2017. Retrieved 3 June 2017. ↑ "One Love Manchester – TV – Areena – yle.fi". areena.yle.fi. Archived from the original on 7 June 2017. Retrieved 3 June 2017. ↑ "Ariana Grande : le concert "One Love Manchester" en direct sur Mouv'". 2 June 2017. Archived from the original on 22 June 2017. ↑ WDR (2 June 2017). "1LIVE überträgt Benefizkonzert "One Love Manchester" – Presselounge – WDR". presse.wdr.de (in German). Archived from the original on 7 November 2017. Retrieved 3 June 2017. ↑ ""One Love Manchester" – Konzert live im rbb". www.rbb-online.de (in German). Retrieved 3 June 2017. ↑ "NDR 2 überträgt Benefizkonzert". www.ndr.de (in German). Archived from the original on 2 June 2017. Retrieved 2 June 2017. ↑ "Eqqaaniaalluni tusarnaartitsineq TV 2-mi allakaatinneqassaaq". KNR. Archived from the original on 12 June 2017. Retrieved 5 June 2017. ↑ "ViuTV". www.facebook.com. ViuTV. Archived from the original on 5 January 2018. Retrieved 3 June 2017. ↑ "Kærleikskveðja frá Manchester á sunnudagskvöld". RÚV. 2 June 2017. Archived from the original on 5 June 2017. Retrieved 2 June 2017. ↑ "Ariana Grande's One Love Manchester concert to broadcast live on 2FM". her.ie. 1 June 2017. Archived from the original on 1 June 2017. Retrieved 1 June 2017. ↑ "One Love Manchester, domenica su Rai Uno dalle 20,35? Biglietti esauriti, bagarini già al lavoro, e c'è anche chi si finge vittima dell'attentato". rockol.it. 1 June 2017. Archived from the original on 3 June 2017. Retrieved 1 June 2017. ↑ "One Love Manchester, in diretta su Rai1, Rai4 e Radio2". 3 June 2017. Archived from the original on 6 December 2017. Retrieved 3 June 2017. ↑ s.r.l., RTL 102.5 Hit Radio (4 June 2017). "One Love Manchester su RTL 102.5". RTL 102.5 Very Normal People. Archived from the original on 6 June 2017. ↑ "One Love Manchester: Su Super! in diretta il concerto di Ariana Grande! – Super! TV". Archived from the original on 2 June 2017. ↑ "Mančestras piemiņas koncerts tiešraidē Pieci.lv". www.pieci.lv. Archived from the original on 6 December 2017. Retrieved 3 June 2017. ↑ "One love Manchester kijk je op npo.nl". npo.nl. Archived from the original on 5 January 2018. Retrieved 2 June 2017. ↑ "Volg het benefietconcert van Ariana Grande op 3FM". NPO 3FM. Archived from the original on 4 June 2017. Retrieved 4 June 2017. ↑ "Ariana Grande's Manchester Benefit Concert Sells within 20 Minutes". 1 News Now. 2 June 2017. Archived from the original on 5 December 2017. Retrieved 2 June 2017. ↑ "Støttekonserten i Manchester blir vist på NRK". NRK. Archived from the original on 5 January 2018. Retrieved 2 June 2017. ↑ Maine, Samantha. "Ariana Grande's 'One Love' Manchester benefit concert set to stream on YouTube, Facebook and more". nme.com. Archived from the original on 17 June 2017. Retrieved 24 June 2017. ↑ "One Love Manchester Concert". RTP. Archived from the original on 6 December 2017. Retrieved 2 June 2017. ↑ ""ONE LOVE MANCHESTER" – Program.sk". www.program.sk. Archived from the original on 6 December 2017. Retrieved 2 June 2017. ↑ "One Love Manchester – dobrodelni koncert, prenos iz Manchestra". Archived from the original on 6 December 2017. ↑ "SVT direktsänder konserten från Manchester". SVT. Archived from the original on 2 June 2017. Retrieved 2 June 2017. ↑ "Benefiz-Konzert: SRF 3 überträgt "One Love Manchester"". Schweizer Radio und Fernsehen (SRF). 2 June 2017. Archived from the original on 5 June 2017. Retrieved 3 June 2017. ↑ "One Love Manchester Benefit Raises $3 Million, Draws Massive Audience". npr.org. Archived from the original on 7 June 2017. Retrieved 7 June 2017. 1 2 "One Love Manchester: Nearly 11 million watched Ariana Grande concert on BBC 1". The Independent. 5 June 2017. Archived from the original on 5 June 2017. Retrieved 5 June 2017. ↑ McIntosh, Steven (2 June 2017). "One Love Manchester: Ticketmaster asks fans for patience". BBC News. Archived from the original on 2 June 2017. Retrieved 2 June 2017. 1 2 3 "Ariana Grande's Manchester Benefit Concert Draws Biggest U.K. TV Audience of 2017". The Hollywood Reporter. 5 June 2017. Archived from the original on 5 June 2017. Retrieved 5 June 2017. ↑ "Weekly top 30 programmes – BARB". www.barb.co.uk. Archived from the original on 27 September 2016. ↑ Clarke, Stewart (5 June 2017). "'One Love Manchester' Concert Racks Up Huge Viewing Figures in the U.K." Variety. Archived from the original on 5 June 2017. Retrieved 7 June 2017. 1 2 Lewis, Rebecca (4 June 2017). "Ariana Grande fans still desperate to get tickets for One Love Manchester". Metro . DMG Media. Archived from the original on 4 June 2017. Retrieved 5 June 2017. 1 2 Howarth, Angus (4 June 2017). "Ariana Grande and Liam Gallagher wow crowds at One Love concert". The Scotsman . Archived from the original on 4 June 2017. Retrieved 5 June 2017. ↑ "55,000 united. The sound of our unity will ALWAYS be louder than the voices of those who would divide us #OneLoveManchester". Twitter. @TeamAriana. 4 June 2017. Retrieved 5 June 2017. ↑ "Ariana Grande to Become Manchester's First Honorary Citizen". Rolling Stone. Archived from the original on 9 September 2017. ↑ Kory Grow (5 June 2017). "Joy Conquers Fear at Ariana Grande's Moving One Love Manchester Benefit". rollingstone.com. Archived from the original on 7 June 2017. Retrieved 7 June 2017. ↑ "Scooter Braun On Ariana Grande's 'One Love Manchester' Concert: 'The City of Manchester Was the Hero'". Billboard magazine. Retrieved 28 March 2019.